The above pic is from a recent ARRL handbook, and is a clear exposition of the coupler. Grebenkemper specified T50-3 cores with 31t and 1t. Note that the 31t winding on the right hand transformer above appears in shunt with the through transmission line, and its magnetising impedance shunts the load. 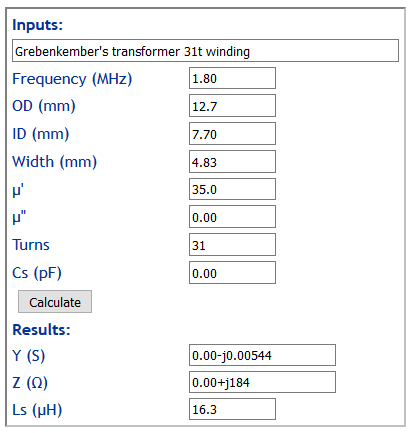 Grebenkemper used T50-3 powdered iron cores, and we can pretty much ignore core loss at 1.8MHz when calculating the magnetising impedance. Additionally, permeability is probably very close to its low frequency value, so we can assume μr=35 at 1.8MHz. It turns out that the calculated impedance is not very sensitive to equivalent self capacitance, so we can make that zero. Above is the core magnetising impedance and admittance. 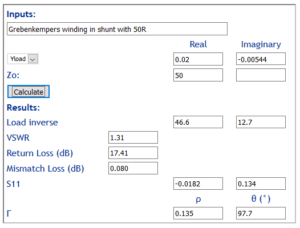 Let us calculate the InsertionVSWR expected when this inductor shunts a 50Ω load (Y=0.02S). Above, we find the InsertionVSWR would be 1.31. This analysis flags a serious risk that couplers built to Grebenkemper’s instructions, and those similar to it, are unlikely to have acceptable Insertion VSWR at 1.8MHz. Duffy, O. Jul 2016. InsertionVSWR of Revex W560 on HF. Grebenkemper, L. Jan 1987. The tandem match – an accurate directional wattmeter In QST. Sontheimer, C & Frederick, RE. Apr 1966. Broadband directional coupler. US Patent 3,426,298.